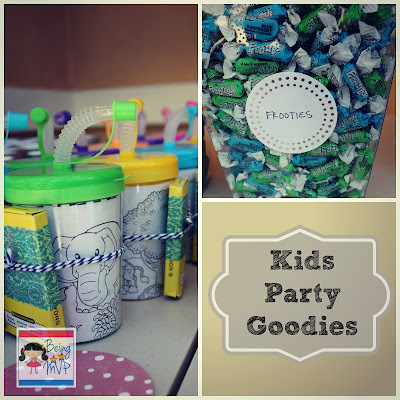 Party planning with ideas from Pinterest is so much fun since there are so many neat ideas! 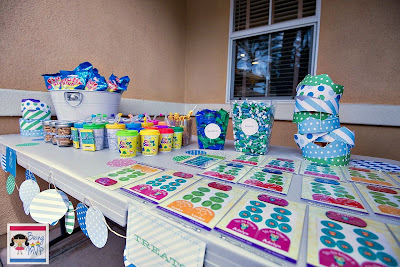 Shindigz sent several items for review for Mason's 1st birthday party and I tried my best to create some nifty decor. Wax Crayons semi-wrapped in washi tape attached to Color Your Own Sipper Cups with fabulous twine from The Twinery. Individual Cotton Candy bags placed in White Beverage Holder from Target. These were a huge hit! Green Buttermints / Blue Buttermints / Sugar Daddy Caramel Pops / Blue Raspberry Frooties / Green Apple Frooties - in the Candy Buffet Container Set. Half Pint Ball Jars filled with crackers and tied with twine with an elephant sticker on the lid. Giant Clear Glass Vases filled with Green Apples, Limes and Lemons. I didn't realize how enormous these were and didn't buy enough filler but I think it still looked great. One on each side of the table. 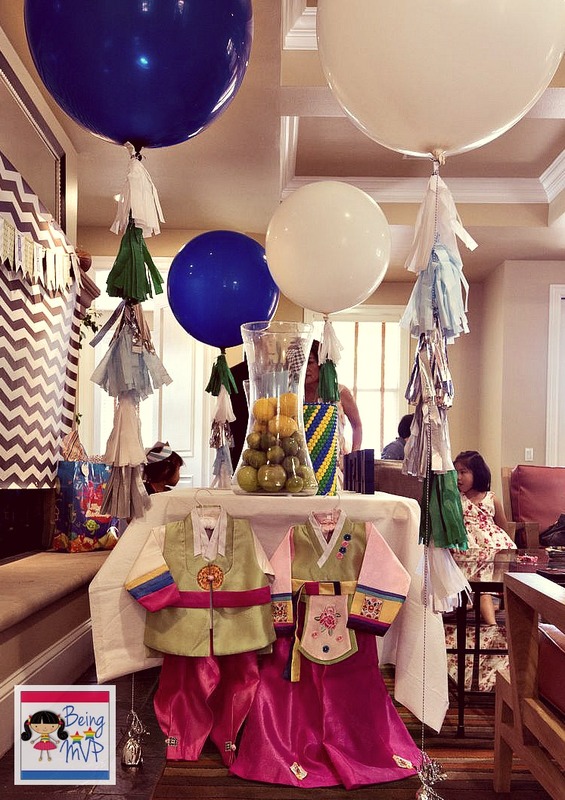 Giant White Balloons and Giant Blue Balloons were dressed up with some fabulous tassels that I whipped up after seeing it on Pinterest. Ok maybe not whipped up as I was working on these at night when the kiddos were sleeping. The fabulous balloons were held down with Silver Foil Balloon Weights. These would also be great for just regular photo ops! Mason Jars were filled with Frooties and paper pinwheels for centerpieces. How fun because people took these home after the party. 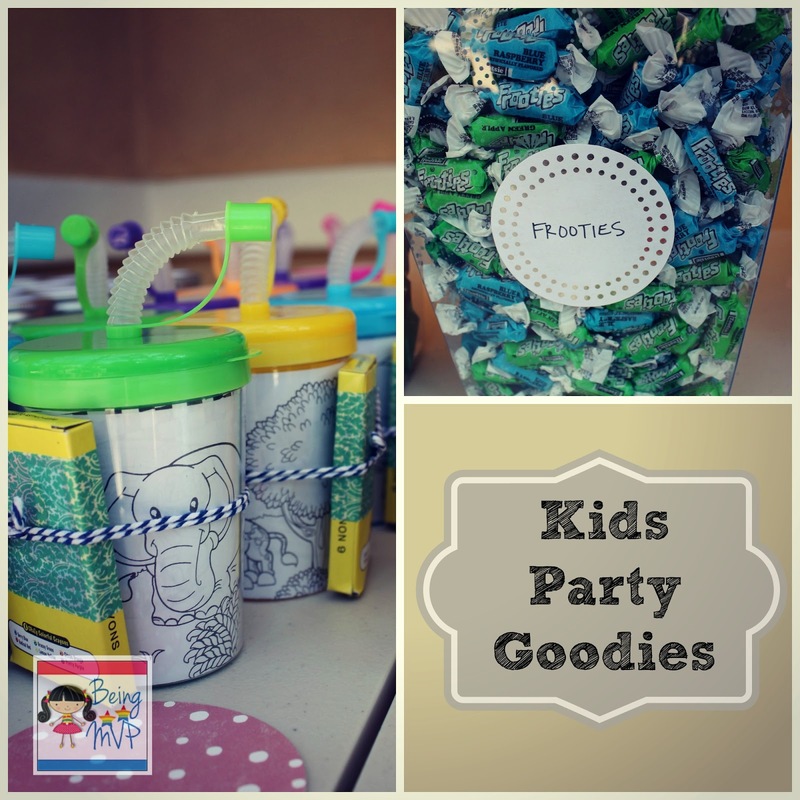 There are so many possibilities and the prices are so reasonable that you should definitely check our Shindigz for all your party planning needs! I love your decorations. Very nice! Beautiful decorations that were tasteful and not tacky! What great decorations! It looks like a professional did this. Amazing!! What a beautiful party you did an excellent job. What wonderful decorations! I hope you all enjoyed his first birthday! I really love the little favors, so nice to have something that can actually be used and enjoyed later on! Love the giant balloons with the tassels! Everything looks so adorable. Such great ideas. My daughter's birthday is coming up in a couple weeks. I'm going to try to make some of these! Omgosh such a cute idea!! I love the color theme instead of a specific theme !! Super fun!! And I adore Oriental Trading co for buying our party supplies too!